The Astoria-Megler Bridge stretches 4.1 miles (21,474 feet) from Astoria, Oregon, across the mouth of the Columbia River, to Point Ellice, Washington, at Columbia River Mile (RM) 14. The bridge replaced previous ferry lines running from Astoria to Washington. The main span is a 2,468-foot steel cantilever through truss, and is flanked by five steel deck trusses, one hundred forty 80-foot concrete deck girder spans, and, at the Washington end of the bridge, seven 350-foot steel through truss spans. 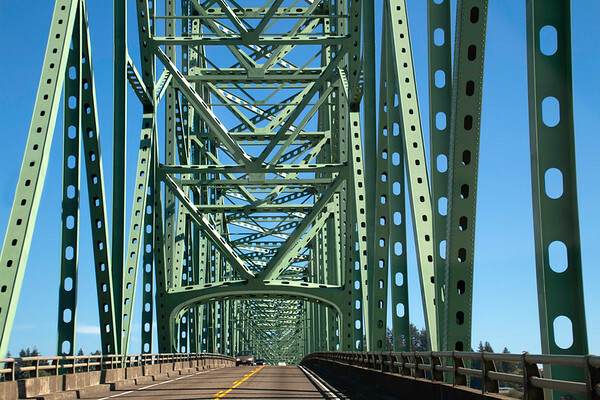 The bridge was designed jointly by the Oregon and Washington state highway departments. Construction on the the Astoria-Megler Bridge began in 1962 and was formally dedicated August 27, 1966. Initially the bridge was a toll bridge. However, in 1993, a full 2 years early, the bridge was paid off and the toll was removed.